How strong should DLC characters be? Fighting games are growing in popularity. Titles such as Street Fighter V and Tekken 7 have each shifted more than two million copies. These are impressive numbers but are far from where it will end. As the hype dies down, it’s common for developers to schedule the release of several new characters in the form of a season pass. This brings in new players and brings back old ones who may have left to devote their time to another game. With all this potential, it’s no surprise that crossover characters have become so popular. Final Fantasy XV’s Noctis recently joined the Tekken 7 cast and, while some criticised his “gimmicky” playstyle, others were in agreement that he was a unique addition to the series. If that’s not enough, Bandai Namco recently announced that Soul Calibur VI’s next DLC character will be 2B from the acclaimed NeiR: Automata series. But despite an overwhelmingly positive reception, the developers need to proceed with caution on how they balance this guest character. Make her too strong and she may overshadow the rest of the cast, but make her weak and players will feel robbed of their money. The fighting game community aren’t strangers to DLC controversies. We’re looking at you, Marvel vs Capcom: Infinite. To understand the difficulties of balancing DLC characters, it’s important that we understand the effects they can have on the meta. Season 2 of Street Fighter V introduced what would be some of the strongest characters the game has seen. Returning faces like Akuma were accompanied by series newcomers such as the adorable fortune teller Menat and the big, not-so-friendly-giant Abigail. These characters all had one thing in common – they dominated high-level play and it could be argued that they still do. Akuma is one of the most well-rounded characters in the game who, arguably, doesn’t have “bad” matchups while Menat, a zoning fighter with long reach, lured many competitive players away from franchise veteran Dhalsim. Everything this Stretchy Yoga Man could do, this cute girl with a crystal ball could do better. On the other hand, Season 3 of Street Fighter V has been riddled with criticism. While things began with so much promise – when fan favourites like Sakura, Cody and Sagat are confirmed, what’s not to love? – Season 3 didn’t exactly shake up the meta. Sagat’s signature Tiger Uppercuts are lacklustre in comparison to the Flash-kicks of Guile, while even Cody’s unique mix-ups that utilise a switchblade and metal bar aren’t enough to compete with his Season 2 counterparts. He might now be the mayor of Metro City, but he’s brought a knife to a gun fight. The DLC problem doesn’t end with Street Fighter. 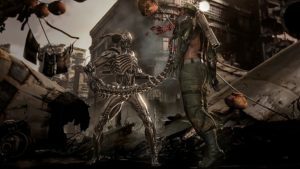 Mortal Kombat X has been subject to its own extra-terrestrial controversy, namely Kombat Pack II. Let’s face it, when the developers are quick to nerf their DLC characters, you know something is up. Other powerful characters aside, the Acidic variation of Alien was so over-tuned that even at a high level he could dominate most of the roster. Naturally, many who purchased this Kombat Pack couldn’t complain. After all, the characters they had paid for were very much viable. The criticism stemmed from those who couldn’t afford the DLC; the game now felt too pay-to-win. In addition, there were some complaints that these new DLC characters were dominating the tournament scene and overshadowing the main cast. A season pass should support a game, not define it. However, you have to give the developers some credit. Achieving the right balance could be compared to plate spinning. Too much focus on ensuring DLC characters are not “God Tier” could risk them being unplayable at a higher level, and vice versa. So, how strong should they be? I think it’s important for these characters to have a unique playstyle that persuades you to purchase them, but they shouldn’t be single handily capable of reshaping the meta. This would be insulting to the main roster. For Soul Calibur VI, 2B has everything from a command dash to fancy aerial combos. Fans of the hit JRPG will be sure to pick her up. But the decisions Bandai Namco make in these moments could define the game for eternity.